The outcome of the court case involving Apple and Samsung has been made known. In repercussion, other tablet manufacturers will now be more careful with the design of their upcoming products. But let's put that behind us for now because we are going to be in for a busy Fourth Quarter as far as tablets and smartphones are concerned. Apple is scheduled to launch the new iPhone (iPhone 5) on September 12. Meanwhile, Microsoft will launch its own tablet, the Microsoft Surface on October 26 - the first tablet to run on Windows 8 operating system. To be precise, the Surface will run on Windows RT and the Surface Pro on Windows 8 Pro. 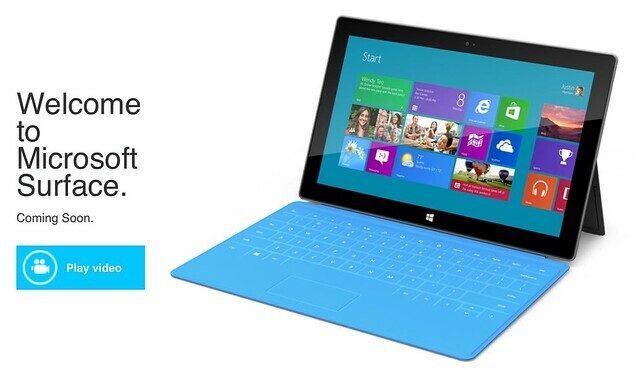 Launching on October 26, 2012, the Surface will be available together with Windows 8. The Surface Pro to be available 3 months after that. The Tablet will be available in two versions, "Surface" and "Surface Pro". Surface will run the Windows RT operating system and the higher end, Surface Pro will run the Windows 8 Pro operating system. We shall see if the Surface, especially Surface Pro is a contender to the iPad. If priced competitively it should be a good option for the fans of 10-inch tablets.